When someone says they’re going to physical therapy, usually they’re recovering from some form of injury or surgery. While that reason may be the most commonly thought of, it is certainly not the only reason people seek treatment. A study published by the Center for Disease Control in 2018 stated that 50 million Americans live with chronic pain. Additionally, 40 percent of those people have “high-impact” chronic pain, a condition that regularly affects their ability to work and live successfully. While that number seems astronomically high, 50 million people is a little less than 20 percent of all Americans. It can be difficult to understand to a full extent the effects that chronic pain has on a person. Someone who suffers from chronic pain is extremely likely to develop further complications — both physically and psychologically — such as depression, anxiety, sleep deprivation, memory loss, and relationship strife. Chronic pain is classified as a constant pain lasting longer than 3 months at any given time. In most cases, it is incurable. As a result, the best treatment for living with chronic pain is usually acceptance and management. That management plan can vary depending on the doctor and the person, but most common plans involve a combination of techniques, diet, exercises, engaging in a hobby, and some form of psychotherapy. 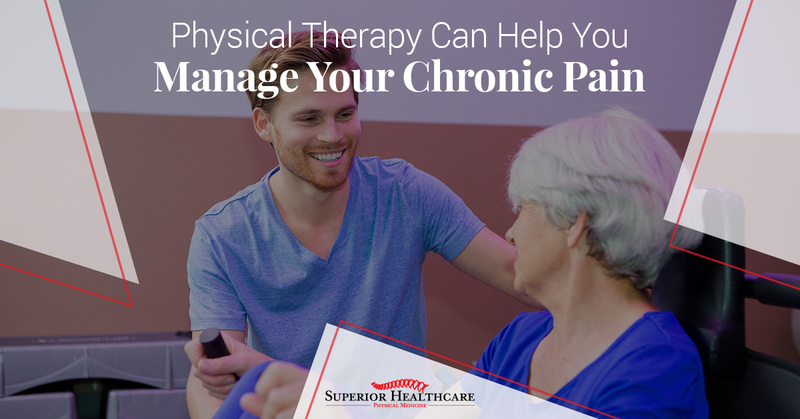 Superior Healthcare offers the best physical therapy in Metairie, LA for people looking for help managing their chronic pain. Physical therapy, much like psychotherapy, creates a close bond between the therapist and patient. Physical therapists also work with a large range of physical ailments, giving them a thorough understanding of the effects of chronic illness are extremely personal and specific. They can alter the exercise routines to provide a highly unique and particular pace to provide maximum benefit to the patient. Exercise is crucial for a person dealing with constant discomfort. More often than not, this kind of pain leads to a life of inactivity. A sedentary lifestyle comes with its own consequences such as a reduction in strength, balance, endurance, and confidence. In fact, exercise is an important part of the healing process, because a healthy body helps maintain the ability to thrive despite the pain. At Superior Healthcare, we offer two different types of physical therapy for the rehabilitation of those in our chronic illness community. Chronic disease can sometimes affect your muscle mass and strength. One of the best ways to combat the degradation of your muscles is to work with your physical therapist. They will develop a series of movements that will increase your strength over time. Increasing strength not only helps the muscles but on the whole, can help your balance as well. Range of Motion is the measurement of the angles at which a joint can bend. This type of therapy is critical for people with a chronic illness, especially one that has damaged the muscles and connective tissue in the body, because it is the healthiest and safest way to restore motion to the best of your ability. Despite the lack of a cure, continuing to suffer is not the only option for people with chronic pains, illnesses, or diseases. Superior Healthcare is here to help with the best physical therapy available in the lower Louisiana area. Contact us for more information about our physical medicine services.